Danielle’s Daisies 3 pc. Queen Bedding Ensemble has all that your little one will need. Let the little lady in your home drift off to sleep on this enchanting set. Bright and Lively, the Girl Power Set will brighten any room. The comforter features a gorgeous lavender center with darker purple border all made with 100% cotton fabric. It is adorned with multicolor 3D bright daisy flowers in all different colors. 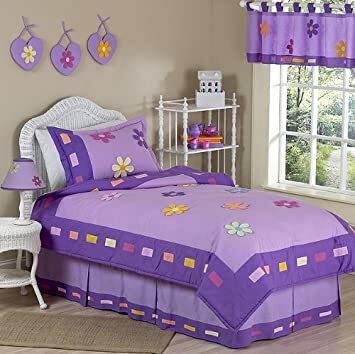 Danielle’s Daisies Purple Childrens Bedding 3pc Full / QueenBuy It!